You are here: Home / News / The Race Of Science Is The Science Of Race. The Race Of Science Is The Science Of Race. (ThyBlackMan.com) Today rockets pierce the heavens. Men walk the moon. And we communicate, mind-to-mind, instantaneously, projecting our voices through the ether, our images onto the screen and our thoughts over the net. We “make” babies in test tubes, and toy with the idea of re-creating, that is, cloning ourselves. Scientists are hard at work attacking every secret of the universe, including its genesis. However, as we rise, so too we fall. We pollute the planet with nuclear refuse, the burning of fossil fuels, and with every throw away fork and plate we use. The catalyst for this insane race of Science is the Science of race. 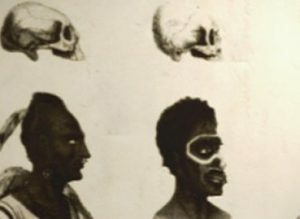 So, we see that at the very inception of modern science, a distinct “white race” was said to be superior to all other “races.” Yes, the concept of race has long since been debunked, but it still holds sway over the scientific community. Western thinkers cannot look beyond and before Greece in 600 BCE if, that is, they want to maintain their bona fides. That is when and where the idea of a purely rational world view was conceived. Thus, we find ourselves carried along by a relentless tide of scientific discovery and its unthinking application to the creation of every device, process and procedure imaginable, notwithstanding the cost to our environment and ourselves. We do not know where Science is taking us because we will not countenance where it came from. In Africa libations are poured to honor the ancestors. In the Academy, scientists employ footnotes to document their work. Are they not the same? With footnotes we credit those on whose shoulders we stand, our ancestors on the journey of scientific inquiry. Citations give them their due and enable those who come after us to use our sources in the ongoing inquiry. Likewise, with libations we honor those who came before and made our lives possible, the ancestors. Scientists badly damage their endeavors when they fail to credit those who came before, their scientific ancestors. This is not just a failing to give credit where credit is due. It distorts the scientific enterprise. The systematic exclusion of Africans’ and others’ accomplishments profoundly warps the nature and application of scientific inquiry. We know full well that race is not a valid concept, but still we subscribe to it. We learned long ago that pure rationalism cannot explain the world and all that it contains, but still we still cling to it. And things are, in fact, real insofar as we believe them to be so. Thus, two bankrupt concepts, race and pure rationalism, though long discredited, lock each other in place. However, the more we can come to see the holism of humanity, the more we will see the whole that is all humanity’s search for knowledge. Black Studies and all the other Multcultural Studies are tools to unravel this Gordian knot. African Americans’ struggle for equality is not just about equal rights for individuals. It also seems equal standing for the contributions of the cultures that produced Africans. Ditto the struggle for equality of Native Americans, Latinos, Asians, Women, Gays etc. Whereas European civilization created the exclusively rational science which is despoiling the planet, other civilizations functioned in harmony with Mother Nature. To the extent that Black Studies focuses exclusively on the Black struggle, ignoring other movements, to that extent Black Studies falls prey to the same piecemeal rationality of the Science of the West. Yes, Black Studies’ interests diverge from the other Multicultural Studies, but they converge as well. Though difficult, a balance must be sought. And balance is what all humanity wants, balance between the convenience and comfort that Science has provided and the toll it takes on us. Kiyonnosatsqui, a life out of balance, is what the Native Americans call how we live today. Just as each of us is an individual organism, we are each an organism within the super organism that is the US body politic. And the US is but a single organism in the super organism that is humanity. These are all just different orders of magnitude, and the highest order of magnitude is the all-encompassing super organism, the entirety of life on Earth. Global warming is the Earth’s attempt to balance out our depredations. We are essentially a fungus on the fruit that is the Earth. Note a parasite is neither good nor bad even should it destroy its host. It simply is. We simply are. The prime directive of all living things is to go forth and multiply, and multiply we certainly have. For more articles written by this talented brother click on the following link; http://thyblackman.com/?s=lewin. Empirical science, the science of sense impression,proceeds from hypothesis to thesis to law. This kind of scientific practice assumes an ignorance of reality’s phenomenon which must be investigated.This method of investigating perceivable phenomenon leads to human knowledge, and probably to eventual wisdom about the natural environment within which we exist.Empirical science in, and of itself is not the sole possession of any race. Scientific truth stands independent of man’s mastery.The white man does not have exclusive jurisdiction over scientific knowledge, and in America the only ones being seriously deprived of the beneficial findings of empirical science are the American citizens. We are being kept in the “stone age”of scientific truth because of capitalism, and political control. We get scientific discoveries only when it is profitable to the discoverer or inventor, and permissible by political fiat.I suspect that Albert Eienstein’s theories have been thoroughly investigated, and proven.I also suspect that time travel is possible,and that we know for sure that we are not alone in the universe.Isn’t it suspicious that we can pinpoint land a vehicle on the moon, and we still string electrical wires to bring electricity to our homes? We are not thinking fungus,we are scientifically defined as sub-atomic particles temporarily suspended in multidimensional space plus the axis of time. If anything, we are scientifically misinformed residents of a mysterious inaccurately explained universe. Our scientific inquiries have gone far beyond racial considerations. Private industries can now plunder, and economically exploit the vastness of inner and outer space.